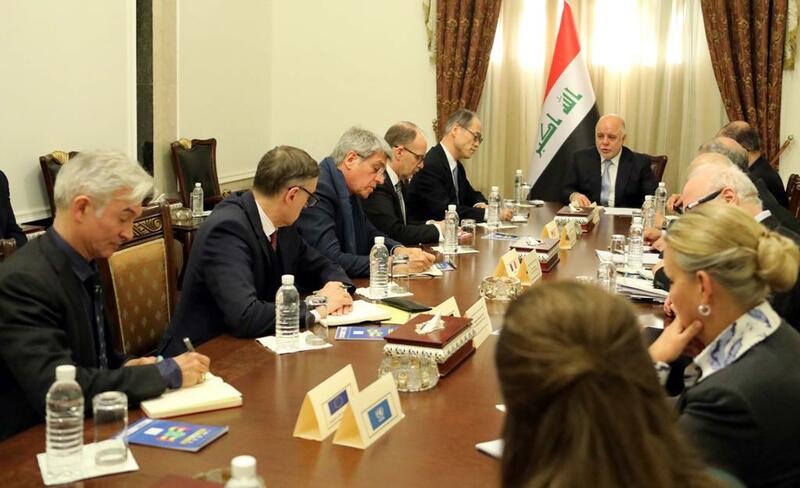 His Excellency Prime Minister Dr.Haider Al-Abadi has held a meeting with the ambassadors of the Group of Seven the largest advanced economies in the world, The Ambassador of the European Union, the representative of the World Bank and the representative of the United Nations Development Program. During the meeting, they have discussed enhancing relations with the major industrial countries and supporting Iraq in all fields, confirming that Iraq is taking correct steps in the field of reform and developing its capabilities. They have reassured on the importance of working towards the success of the Kuwait's conference, attracting investment and economic integration of the region. Dr. Haider Al-Abadi has reassured on the government willingness and its ongoing work in reforming of the country economy, pointing out that Iraq is currently working with the World Economic Forum to hold a mini-Davos conference in Iraq. His Excellency has reassured the importance of accelerating the steps to stimulate the economy, creating jobs, paving the way to investment after the victory and the need to pay attention to meet the needs of all Iraqi regions. The Group Seven's ambassadors, the European Union and the World Bank representative have expressed their great support for the economic reform in Iraq and their serious participation in the Kuwait's conference. They have renewed their continuing support for the economic reform program, their strong stand with Iraq in the battle of construction, reconstruction. They have welcomed the steps taken by the Iraqi government in attracting international expertise and companies in various sectors. The representative of the World Bank has confirmed the bank's completion of the special report in the clarifying the needs for reconstruction to be launched at the Kuwait's Conference. Meanwhile the representative of the United Nations Development Program assured extending of the program work for restoring of stability to 2018 and he is going to launch the fast program system for reconstruction projects at the Kuwait's Conference.